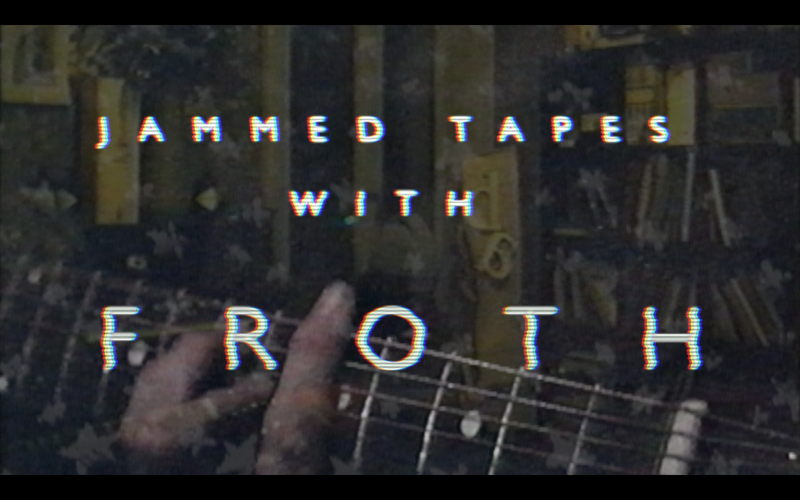 ::: JAMMED TAPES SESSION ::: FROTH – IS YOUR CLAM IN A JAM? I first heard about Froth about a year ago, when their mind-blowing single Lost My Mind came out, a surf rock whirlwind accented by what at first seemed like a swirling organ, but turned out to be an Omnichord. Their sound was then completed by an electric twelve string. These two unusual instruments, combined with their original songwriting, quickly set them apart form the garage surf scene surrounding their native LA turf, opening new horizons from a scene that lately seems to be caught up in itself. During the following year, the band’s talent was picked up by Hedi Slimane, who after attending Burgerama, handpicked them to soundtrack the Saint Laurent Paris 2014/2015 F/W fashion show with a fifteen minute version of General Education, which in turn opened up the doors towards a broader audience (one of their new songs, Postcard Radio,was premiered by Vogue last month). Last Saturday we met ahead of their gig in Lugano, Switzerland, which fell about halfway through their first European tour promoting their second album Bleak, released in Europe last month on Azbin Records and out on Burger next month. We met at il Casotto, a house that used to be the residence of Lugano’s finest, The Pussywarmers who have now turned it into one of the most fun venues this side of the Alps. Located above a funeral parlour and across the street from Lugano’s cemetery, it hosts nights akin to an Animal House party where anything and everyone is welcome. In the late afternoon I sat down in the living room with Joo Joo Ashworth (Vocals & Guitar) and Cameron Allen (Drums) who played two cuts from Bleak, which in their stripped down versions sent off a beautiful melancholy vibe and showed a fledging maturity in their songwriting, surf rock this was not. The two songs they played for me, coincidentally both the album’s opening song Afternoon, and its closer, Sleep Alone, showcases a lyricism and musicianship apparent in each song off Bleak. A few hours later, after Swiss band Late Late Show warmed up the audience with their catchy garage’n roll, Froth took the stage. Cole Devine, formerly of Cosmonauts and who records as a solo artist under the moniker Black Sea, joined Froth while they were recording their second album, adding a second guitar in place of the Omnichord, an instrument that the band felt had become more of a gimmick than the right element for their musical expression. As the first notes rang it was evident that this was a very different band to the one that had recorded Patterns just over a year and a half ago. The two guitar formation veers far from the surf rock the band was initially known for and makes a sound unique in its own kind – psychedelic punk rock where driving rhythms, verses and choruses often lead to breaks and solos stemming from Joo Joo’s guitars. Although it’s not all he plays, you can hear he’s made the electric twelve string his own instrument, eliminating the chimey, jangly sound the instrument is usually well known for, and using it to add more depth and texture to the electric distortions. Hips shaking and heads bopping, the audience may not have gotten what they had expected when they stepped into the venue, no omnichord and no surf rock, but what they did get is a revolution in sound, far from the current wave of garage surf hubbub that spawned the band before their eyes. What may have started off as sea-foam frothing under the sun on a surf rock beach is now starting a riptide that’s going against the grain and exploring something new, and as ears were left ringing in Casotto‘s living room after their last song, you could almost hear the dead underneath and across the street tapping on their caskets a rhythm with their feet.